In 1978 Jay Thelin and Terry Thompson founded the Thelin™ Co. Inc. with the purpose of manufacturing wood stoves with an old time Parlour or Pot Belly look. These round stoves were quickly accepted by the market and became known for ease of lighting and quick heat generation into a living space. In 1986, after the EPA promulgated air emission regulations, the Company developed one of the first wood pellet heaters in the U.S. for residential heating. Early Thompson pellet stoves (as they were called then) worked well, however, they were not as user-friendly as desired by consumers of the 80's. In 1988 Thompson left the Company to pursue other interests and Thelin™ Co. began re-tooling the pellet stove to offer consumers a more user friendly stove with the benefit of 12VDC battery back up technology. In 1993 the company introduced it’s first battery backup pellet stove models Parlour 3000 and Gnome. These stoves operated on 27 watts of electric power and were equipped with a high speed fan driven "Clean Mode" assisting in drawing ash from the heat exchange. The low power consumption and full time battery back up feature was recognized in the United States, Canada, and Europe as forward-thinking and the company prospered. In the 1990's the Parlour look was developed into a gas fired heater models to broaden the company’s offerings and to take advantage of clean burning and low cost fuels. In 2009, Jay Thelin retired from the company upon the sale of Thelin™ Co. Inc. to Cardon Products LLC located in Sacramento, CA. Under the new management the company pursued several new product categories including a contemporary looking freestanding pellet heater known as the Tiberon and a versatile wood pellet fireplace insert called Providence. Both new models include the backup battery as standard and the Providence could be built into the wall of new constructions and accessed for service with a pull-out tray. Both the Tiberon and Providence models won the coveted Vesta Award from Hearth and Home magazine. Today, as Thelin™ Hearth Products, Inc. we are continuing the tradition of producing innovative and quality products. 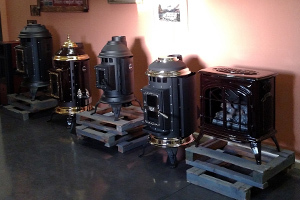 Manufacturing continues on all three categories of stove products including wood pellet, gas, and wood burning models in both "pot belly" and contemporary designs in Carson City, NV. Focused on product design, business integrity, and customer service Thelin™ Co. is an industry leader. We offer extensive online information support through our website and welcome customers and dealers to visit our production facility and showroom just a few miles south of the famous mining town of Virginia City, Nevada.